Last summer my Dearest decided that our youngest at 16 was old enough to be left at home overnight, while we went off for a single night away in a hotel, (Hallelujia, freedom at last.) We booked a night in a lovely Hotel in the Lake District, The Inn on the Lake, Glenridding, at a bargain price. But then the problems began, fancy hotel… what to wear? What to pack? No suitable PJ’s , no decent luggage,I don’t want to arrive looking like the poor relations. Since I plan to make weekends away a regular occurrence in my life I decided a weekend bag was a definite need for me, and my dearest, thought a suit carrier was also required, this night away was looking less of a bargain. 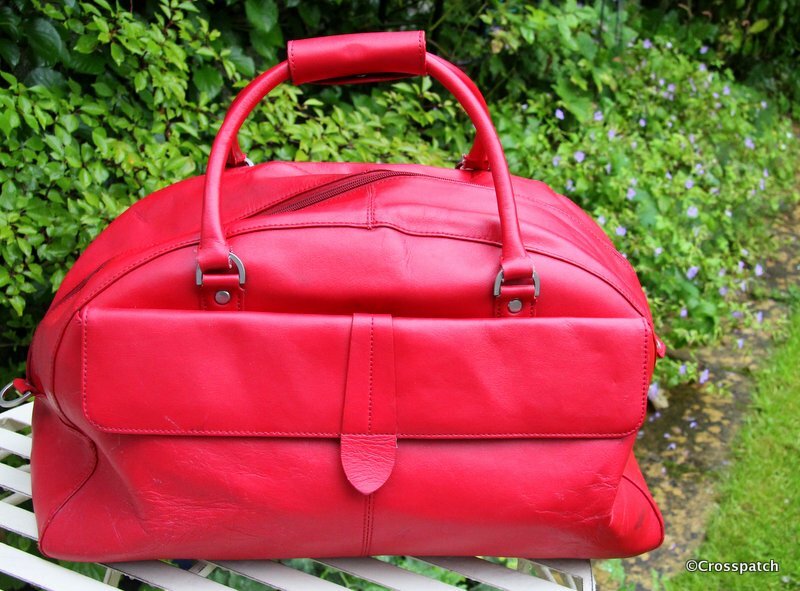 Ebay supplied me with a beautifully supple red leather weekend bag, less than half the price of a new one, I was so pleased with it. I decided what would make it even better would be some matching shoe bags to keep my shoes separate from my clothes, and a pair of slippers too. And I was going to make them with as little money spent as possible. 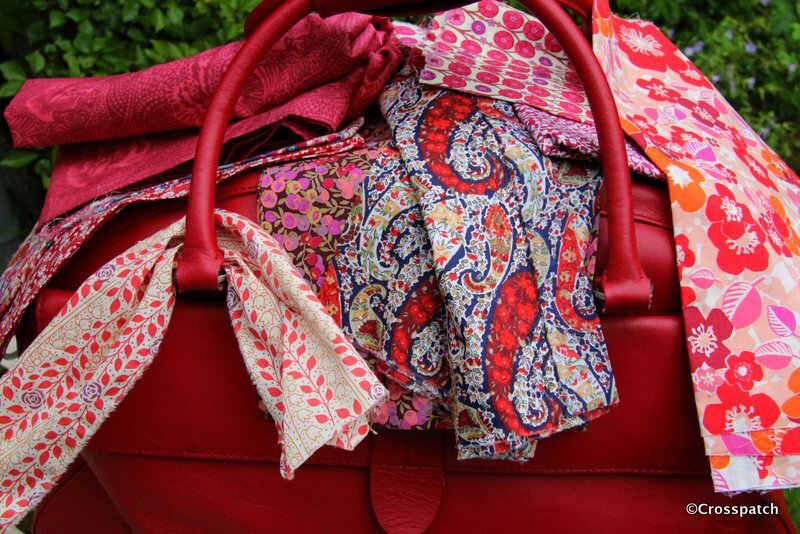 A quick look through my stash yielded a number of suitable red fabrics for my shoe bags and slippers, deciding which one to use was easy I just draped them over the lovely leather weekend bag in the garden. The Liberty Tana lawn in the middle? Yes. 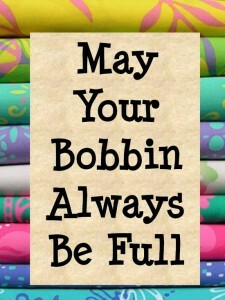 I love Pinterest, you just search for a pattern and up comes exactly what you need. 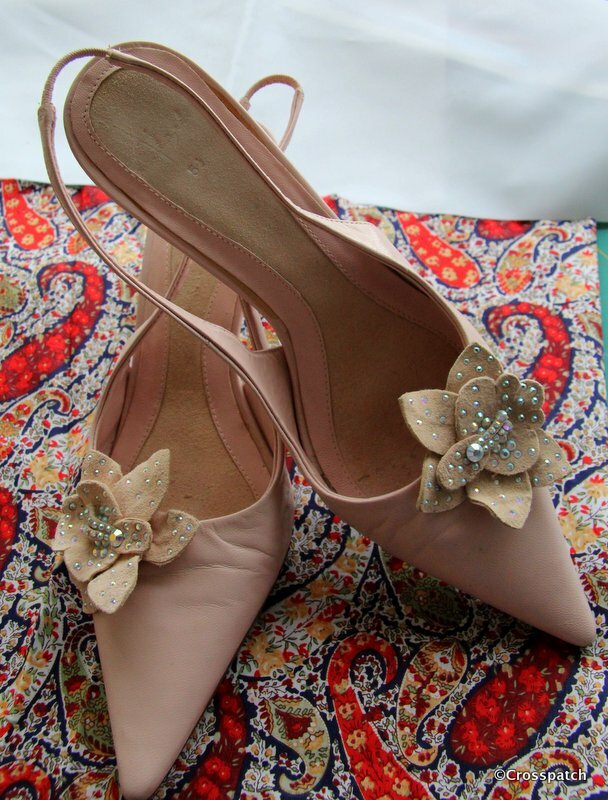 In this case a Butterick pattern for Slippers from 1955. And Purlsoho.com for the shoe bags. 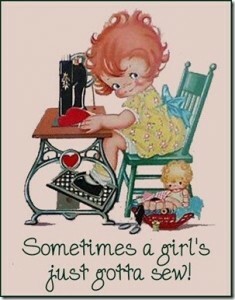 I rooted out those fancy evening shoes, the only decent heels I’ve got and cut the fabric to make two bags big enough to fit those shoes, my usual flats will fit if they do. Two simple bags, the tops turned down to make a tube for the drawstring , and ribbons for drawstrings. 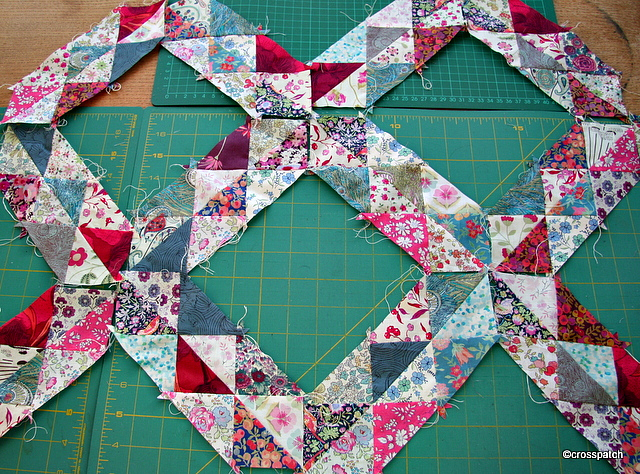 Cut out and ready to quilt. 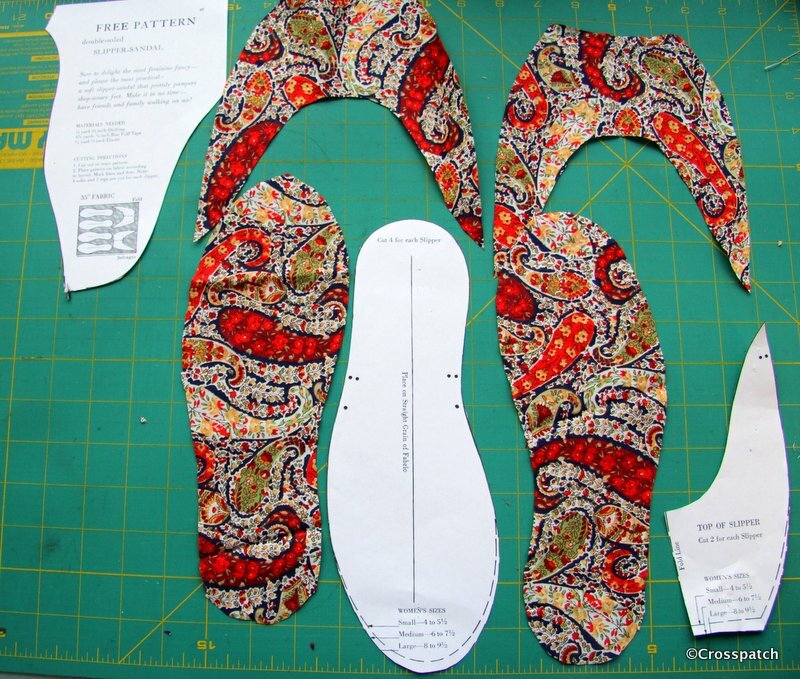 And so to the slippers, I printed out the pattern, and put my foot on it, to check the size, it looked a bit big but better that than too small. I could always trim it back once I started putting the slippers together. Cut 4 soles, 2 left two right, and 4 tops, which are the same shape left and right. 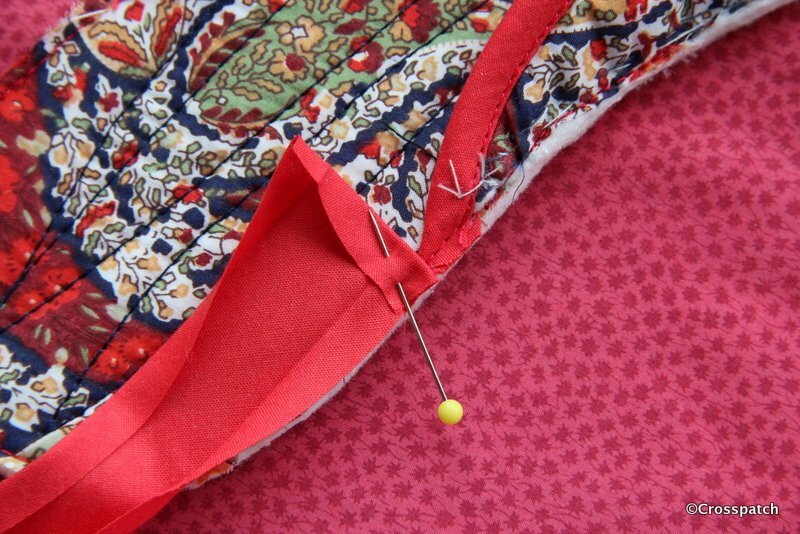 The wadding is a piece of curtain lining with a needle punch wadding on one side, to line winter curtains. To stiffen the slipper sole I used iron on Pelmet Vilene, it comes in a handy width, just a tad less than the width of my slippers.The only thing I bought was the red bias binding. 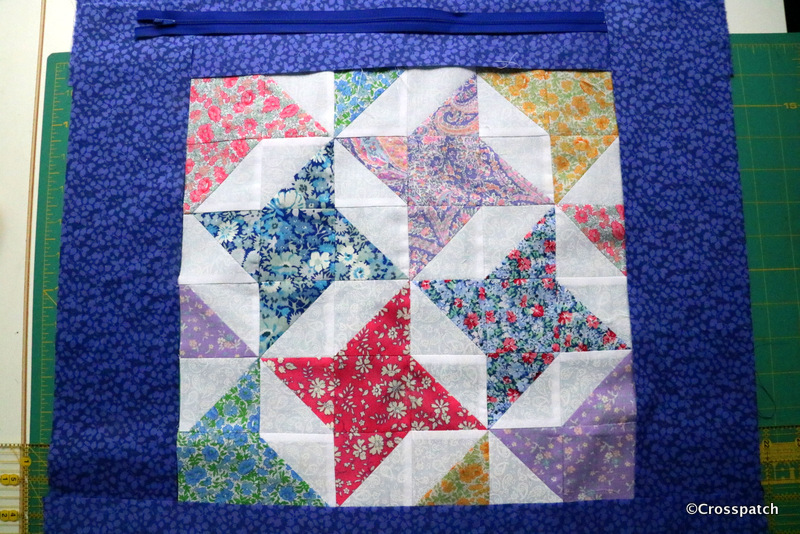 The pieces were put together and quilted with random lines of stitching, I was up against it time wise, needed to finish them before I began to pack , so I wasn’t too picky about the quilting, it just needed to hold the layers together. I just needed slippers to go in the bag. I managed to stitch one slipper together before I had bound the raw edges of the slipper top…Doh! Un-pick and start again Alison. My only struggle with the slippers was with the bias binding, it wasn’t quite wide enough to stitch on the top and then ease over onto the back and catch down with topstitching, I had to top stitch 2 or 3 times to ensure I caught it all the way round. I think I should have trimmed the sole back more accurately before easing the binding over the raw edge. 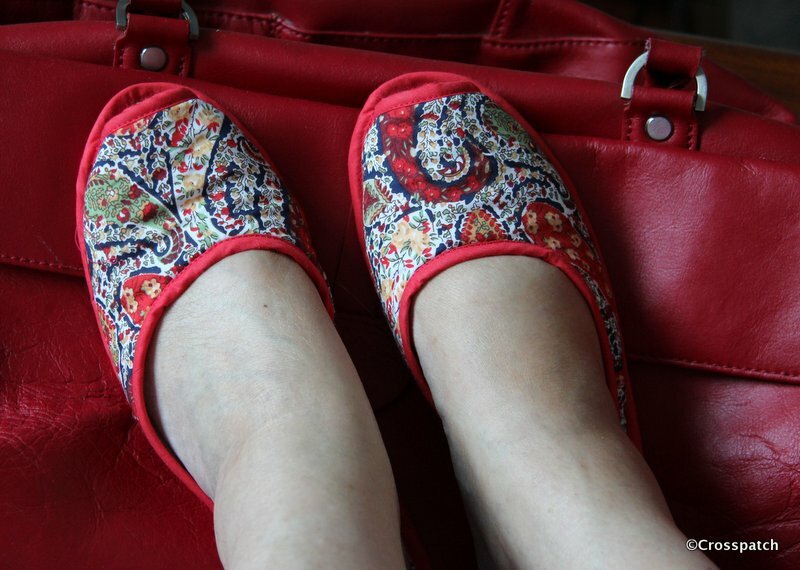 Here you see my slippers, made for pennies, finished on time, bags packed and ready to go on holiday. 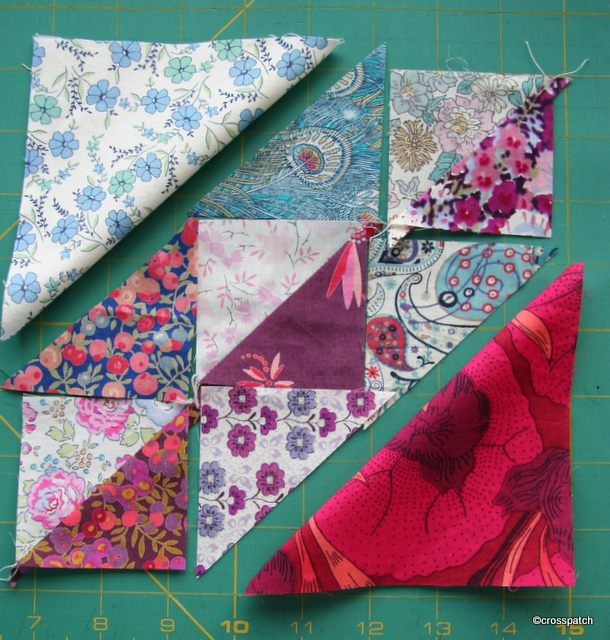 This is something I have been tinkering about with for months; I’m making a scrap quilt from all my Liberty lawns. 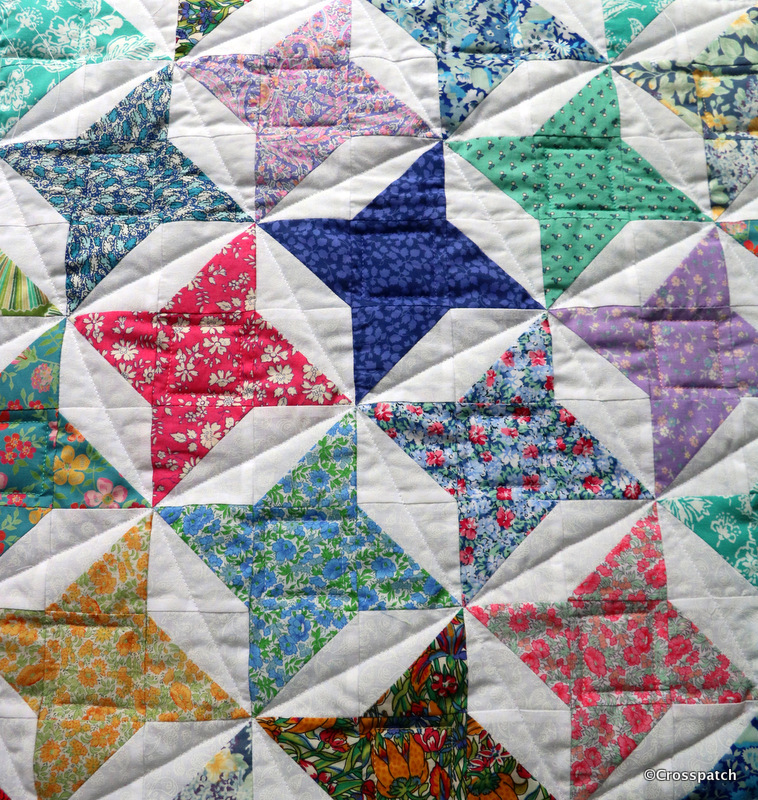 I have many small pieces sometimes a quarter or half yard many with print errors which need to be carefully cut around, so scrappy quilts lend themselves to such a collection. All my Liberty prints are roll ends and misprints from the factory shop, but for a project like this they are perfect. 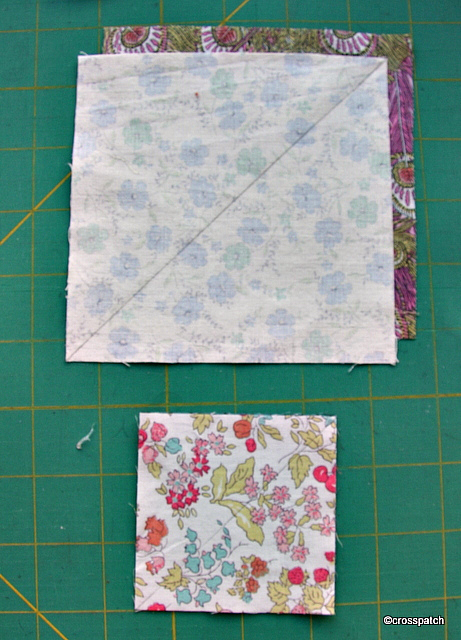 This block makes a wonderful scrap quilt but can just as easily be adapted to use only two fabrics or a carefully chosen mix of your favourite palette, the only stipulation I would make is that you need lights and darks to ensure clear definition, if you choose fabrics which are too close in shade or tone you will lose the pattern. It would work with pastels on white or ivory, for a baby quilt; or two plains for the team colours of any keen supporter, claret and blue for a West Ham supporter perhaps. Imagine it in red and white, a striking alternative to the traditional double Irish chain. Perhaps it would work in black and red if you have a Goth in the household, or black and neon Brights if you want a stunner. I’ll explain how it’s made and give the dimensions when it is finished, but there is a long way to go yet; now that the nights are drawing in and the days getting colder and wetter my garden needs to be “put to bed “, and then the quilting can begin. 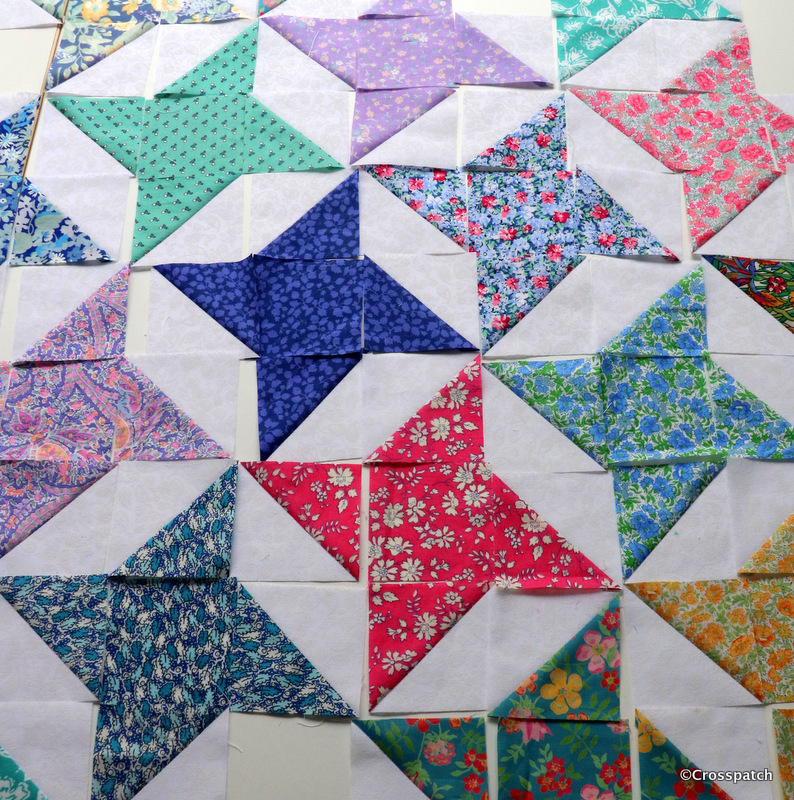 Another year, another challenge, as a long-standing member of my quilting group I do try to rise to the annual challenge, but a couple of years ago I was stuck for an idea, we had to use flowery fabric, and I didn’t have much time, so what to make? 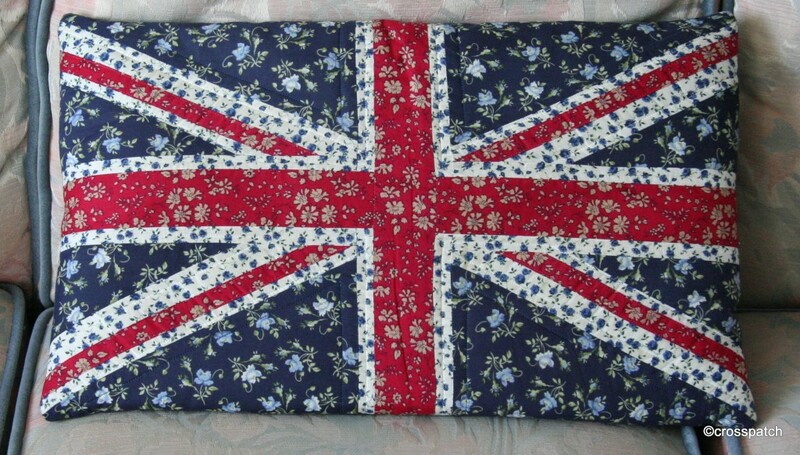 Thumbing through magazines looking for inspiration I came across several Union flag cushions, I’d also seen them in fancy interiors shops, I’d picked up and put down with a gasp examples at exorbitant prices. Then I saw in a magazine, a pastel shaded version, in pretty Liberty prints, and knew that I could produce something similar at a fraction of the cost. 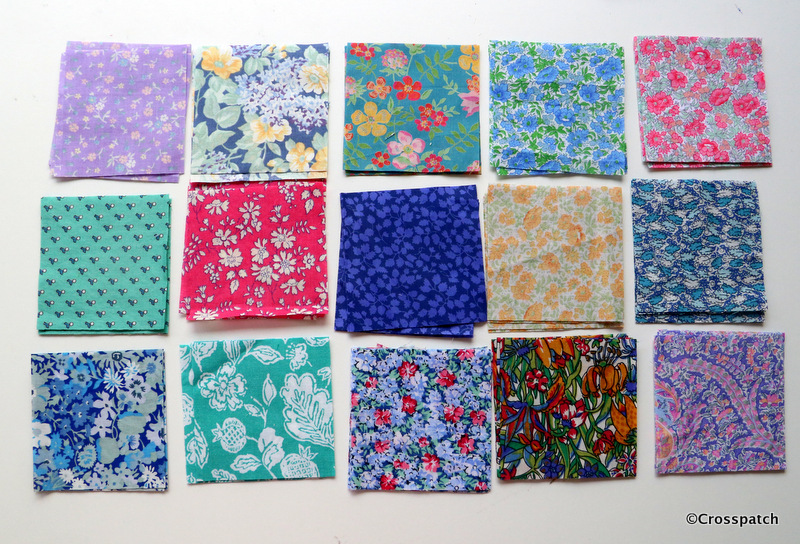 In my stash was the red and cream, both Liberty fabric scraps, and the navy, a 1980’s Laura Ashley dress, My sister reminds me again we had one each of these too, and when she’d worn hers out I gave her mine, which clearly didn’t get worn out before it was retired to my fabric stash. I can’t find a picture of the dress but I guess if you were around in the 80’s you’d remember those dresses, huge mutton leg sleeves, drop waist, voluminous skirts,( think a newly married Princess Diana). Needless to say….. There is enough left to make something else as well, and I already have an idea. So where to find a pattern? I could have spent hours searching the internet for a pattern but fortunately and coincidentally on Armed Forces Day there was a pull out supplement in the newspaper; an advert on the back page pictured half a union flag which was just the right size, so I traced and reversed it to create a sectional pattern to work from. 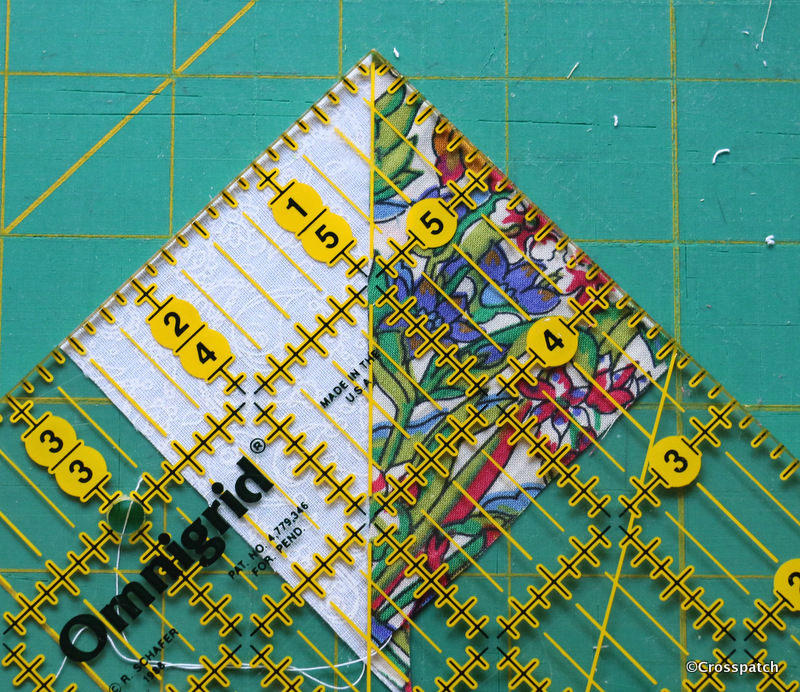 The red diagonal stripe is appliquéd onto the white, the rest of the pattern is pieced. 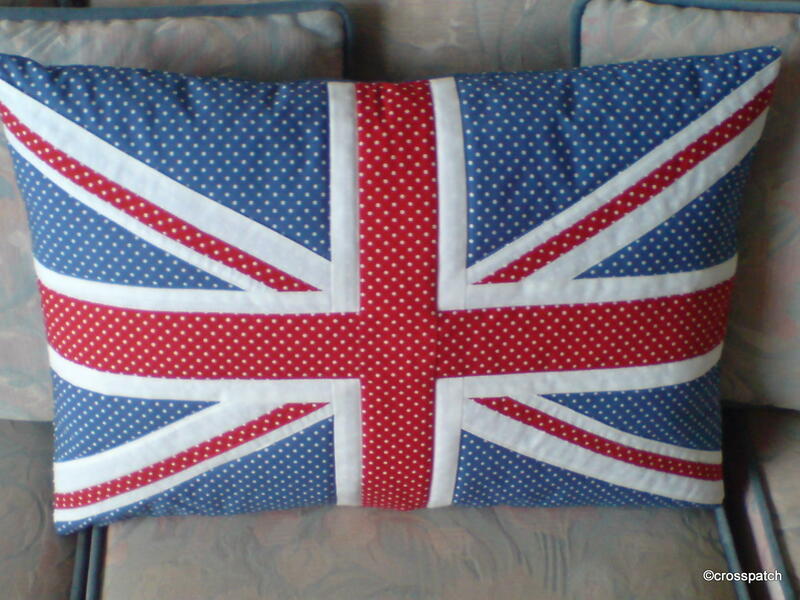 Just before Christmas 2011 my stepdaughter asked me to help her make a gift for a friend who loves the Union Jack; she wanted me to help her make a cushion like mine. Happy to encourage creativity in others I was pleased to assist, this time we bought fabrics, and I amended my technique to simplify the pattern, using more appliqué rather than piecing. 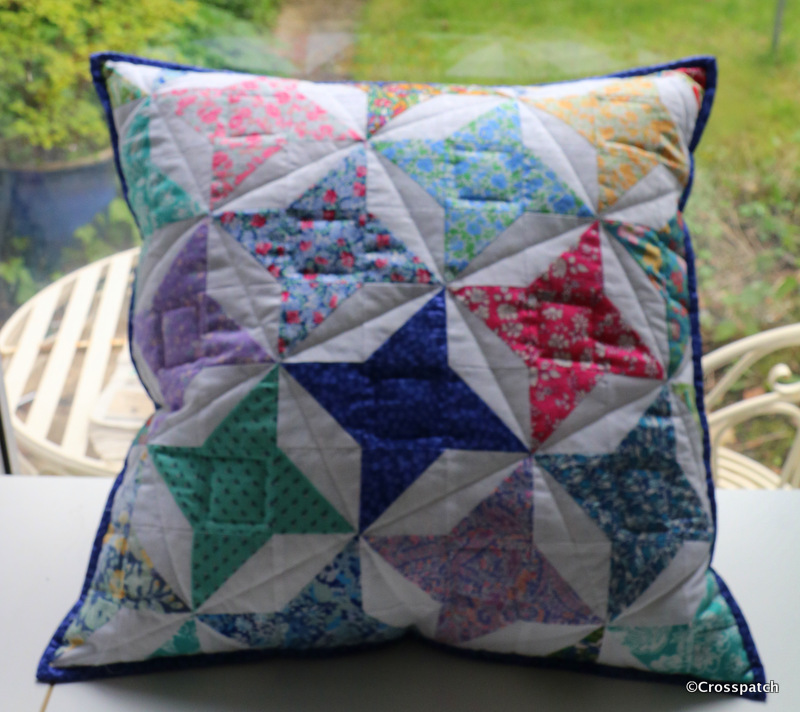 The diagonals are all appliquéd on this cushion. The white fabric was lined to prevent the blue showing through. We were very pleased with the result; I hope her friend was too.